Located in Sithonia, Salonikiou Beach Deluxe Apartments is close to Kortiri Beach and Agii Theodori Beach. 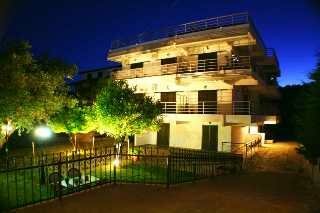 This aparthotel is within the vicinity of Pirgadikia Marina and Trani Ammouda. Make yourself at home in one of the 6 air-conditioned rooms featuring kitchens with refrigerators and ovens. Rooms have private balconies or patios. LED televisions with satellite programming provide entertainment, while complimentary wireless Internet access keeps you connected. Conveniences include desks and separate sitting areas, and housekeeping is provided once per stay. There is no front desk at this property. If you are planning to arrive after 9:30 AM please contact the property in advance using the information on the booking confirmation.